Do you need extra storage space? Putting a storage shed in your yard will help you to increase your storage space. Lifetime Sheds is a great option for you to look at. Rather than spending money on renting storage space from a storage company, many over-crowded families now invest in a Lifetime Shed. Whether you need additional storage space to store your tools, or to store outdoor lawn equipment, a Lifetime Shed is the answer you may be looking for. Lifetime Sheds are constructed using polyethylene plastic for the walls, the roof, and the floor as well as the doors. The sheds are reinforced with steel in the doors, roof and the walls to give it additional stability. By combining the use of steel and polyethylene, Lifetime Sheds has outstanding durability and will hold up well in high winds and bad weather. The outside frame is UV ray protected that will help prevent cracking and damage from the powerful rays of the sun. The materials are powder-coated which helps prevent cracking, rusting and discoloration. Lifetime Sheds are strong and durable and maintenance will be very minimal. Your Lifetime Shed will last for many years to come. The exterior finishes of the Lifetime Sheds are attractive wood-grain textured panels. No painting is ever required and the simple maintenance consists of hosing it down from time to time. The sheds include a shatter-proof, high impact plastic window to allow natural light in. There are screened vents to provide proper ventilation. One of the unique features that Lifetime Sheds has is interchangeable panels for the side walls. If you don’t find the size shed you are looking for, you can purchase extension kits to customize the shed by adding additional panels to make it larger. These extension kits are sold separately. One thing you do have to check in to is that when you add extension to the sheds that make it longer then recommended your warranty will be altered. The company recommends and guarantees only particular sizes for the sheds. So if adding extensions is necessary, be sure to read the company guidelines on extension kits so you know what your warranty will cover. Lifetime Sheds offer a variety of accessories to customize your shed. Battery-powered lighting can be added to your kit, as well as steel-reinforced shelves. When ordering your Lifetime Shed, you can add the accessories you need. There are so many sizes and prices for Lifetime Sheds. And with the option to purchase extension kits, the choices are great. Some of the Lifetime Sheds available are as follows. You can get a Lifetime Shed sized 7’ X 4.5’ for around $829.00. This shed is great for storing small tools and automotive supplies. It is also perfect for storing pool supplies and pool toys. It is great to store inside a carport or patio. It comes with double wide doors which allow for easy access. 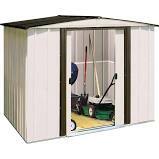 The larger Lifetime 8’ X 10’ storage shed runs around $1,100. This shed comes equipped with shelving units and peg strips to help you organize your tools and things. It is a great size for the backyard. 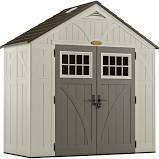 The Lifetime 15-Foot Wide Shed runs for $1,799 and has double doors in the center of the shed. It is 15’ X 8’ and features 2 windows with shutters. It comes with several shelving units and peg strips. If you don’t need it for storage, this Lifetime Shed will make a great play house or fort for children, or a great workshop for dad. 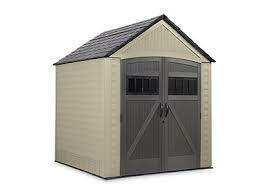 Lifetime Sheds also has a variety of Garage Sheds. There is an 11’ X 21’ garage shed that has plenty of room to turn into a workshop, or to store your recreational vehicles or riding mowers. The carriage-style doors allow you to open up the entire front so that you can move your large items inside. This one will run you around $4,000. Once you have ordered your Lifetime Shed from their website, your new Lifetime Shed is shipped directly to you. Assembly is required. There are step-by-step illustrated directions, and all of the hardware needed to assemble the shed is included. It is recommended that you have someone there to assist you in assembly. It is definitely a two man job to assemble one of these sheds. If a new backyard storage shed is in your future and you are looking for a great styled and durability, then Lifetime Sheds is certainly something to look at. The ability to customize your shed to fit your needs is a great feature. Tuff Shed is one of the largest builders of storage sheds and garages in the United States. They were founded in 1981. They currently have 47 factories that manufacture both residential and commercial sheds, garages and specialty and custom buildings. Tuff Sheds are available online or through dealers throughout the United States. The sheds are shipped directly to you. Pricing and features vary because you completely customize your shed. There are several models to choose from. Once your model is decided on, you can pick the size, paint color, roof shingles and add any customizing desired. The website allows you to Build-A-Quote. Each model is available in several different sizes so you can pick the size you need. There are many paint colors to choose from, so matching your home’s paint color should be easy. You are also given several different colors of roof shingles as well. The Garden Ranch model is available from 6’ X 6’ up to 10’ X 12’. The Garden Ranch has a 4’ X 6’ door giving you plenty of room to fit your lawn and garden tools in. The Garden Ranch comes with a 5 year warranty. The pricing for this model begins at $919 and goes up to around $2500. The base price is based on unpainted structures. The base price for The Premier Ranch model starts at around $1,200 for the 6’ X 6’ model. The Premier Ranch standard sizes range from 6’ X 6’ to 12’ X 32’. This model allows you to place the 4’ X 6’ door on any one of the four walls. This is a great feature to have. The 12’ X 32’ size runs up to about $6,400. This model comes with a 7 year warranty. If you are looking for the “big daddy” of storage sheds, then check out the Premier Barn Garage. This one is available in four sizes that range from 20’ X 20’ up to 24’ X 30’. Pricing runs from $12,000 to $20,000. Perfect for those looking to store additional vehicles. There is a 7 year warranty on the Premier Barn Garage. Tuff Shed also has a Loafing Shed, which is usually used by horse owners to shelter their animals on one side and their tractors on the other. One half of the shed is enclosed, while the other side is opened on the one side and has no floor installed. There is a 7 year warranty on Loafing Sheds. These sheds are custom designed, so you need to contact the company for a price quote. In addition to sheds, Tuff Shed also makes children’s playhouses that start at $749. This 4’ X 8’ playhouse can be customized to fit your needs. There is only a 1 year warranty on the Backyard Playhouse. Tuff Sheds also has great structures that can be turned into a cabin. Yes, that’s right, this shed is the Premier Pro Weekender Barn, and looks just like a cabin. With some interior finishing, this shed will make a great vacation cabin. The shed includes a steel service door, two windows and a front porch. The Weekender Barn sizing starts at 10’ X 12’ and goes up to 12’ X 24’. Pricing starts at around $4,700 up to $8,400. It comes with a 10 year warranty. Check with your town’s ordinances to see if you are going to need a permit before building your shed. Depending on the size of the shed you go with, you may also want to add the structure to your home owner’s policy. Whether you are looking for a children’s playhouse, or enough storage space to store an extra car, Tuff Shed has something to fill your needs. Keep your outside equipment neatly organized and stored out of the weather. Create a workshop or a “man cave”, or simply stash away unused items. Backyard sheds are a great asset to any property. Finally, your stuff will be stored and organized. Visit the Tuff Sheds website and begin building your quote today. They are certainly one of the top shed manufacturers around today.